Q. What is my PassCode? For off-campus access to virtual desktops, you will be asked to enter your username and passcode (password) to login. 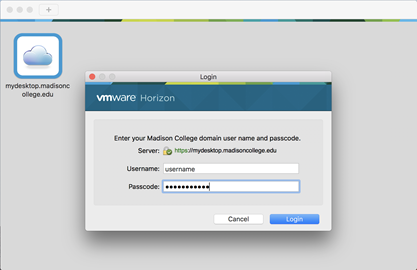 Enter your college password as your passcode in the login screen. Unfortunately Technology Services can't change that wording, quite yet. For off-campus access to virtual desktops, you will need to use multi-factor authentication (MFA), sometimes called 2-factor authentication. Later on in the process, if using text for authentication, you may need to enter another 6 digit code that you receive by text. How do I access my virtual desktop on my own computer or device?